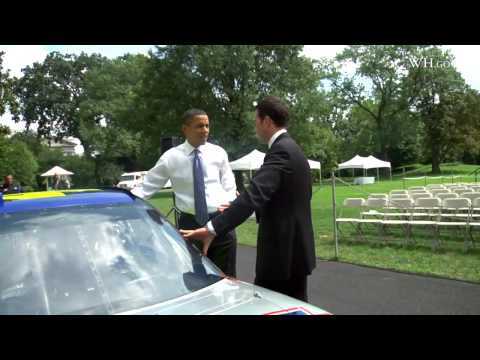 NASCAR Champ Jimmie Johnson visits the White House and takes President Obama under the hood of his Chevy #48. Can Johnson get into the car thru the window while wearing a suit? You'll just have to watch to find out. 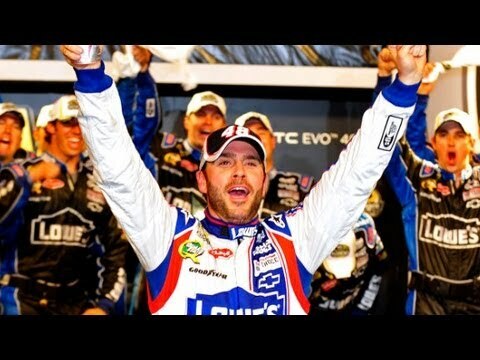 A week after his historic 200th win for Rick Hendrick, Johnson seals the deal again, winning the All-Star Race. 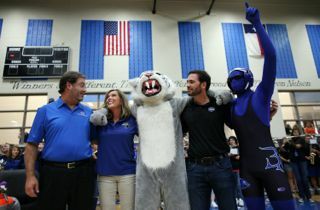 Five-time and reigning NASCAR Sprint Cup Series champion Jimmie Johnson received a hero’s welcome from 1,900 students at a spirited high school pep rally held last Wednesday at Byron Nelson High School in Trophy Club. 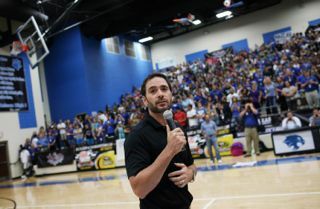 NASCAR racer Jimmie Johnson is considered the most influential athlete today by Forbes magazine, having won an unprecedented 5 straight NASCAR championships. 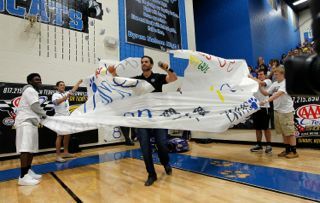 Lee Cowan reports on Johnson's life, career, and family. DOVER, Del. 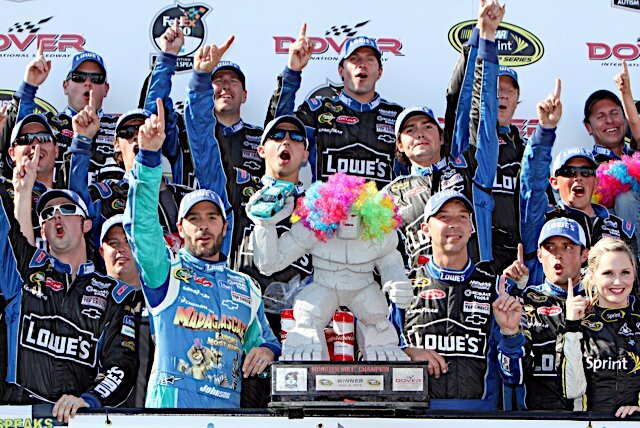 -- The Hendrick Motorsports juggernaut is back -- with a vengeance. 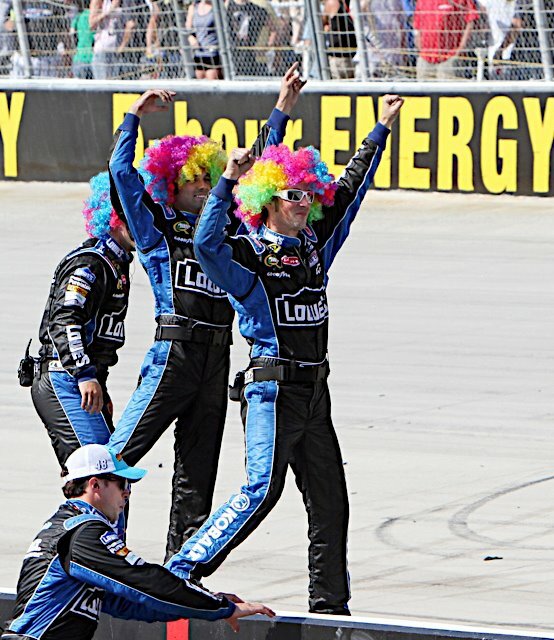 Driving away from Kevin Harvick and Matt Kenseth after a restart with 31 laps left in Sunday's FedEx 400 at Dover International...The victory was the 57th of Johnson's career, eighth most all-time. 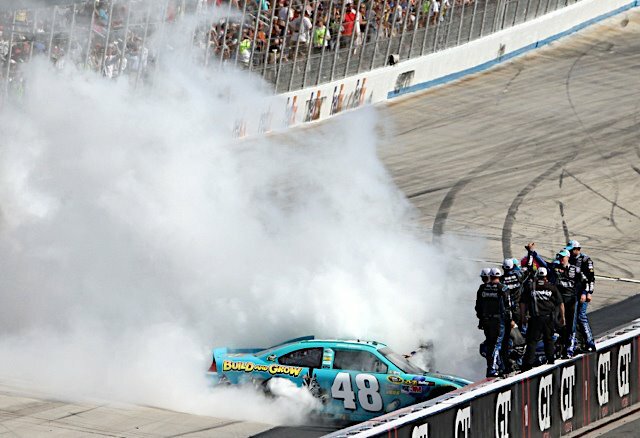 His seventh win at Dover tied Richard Petty and Bobby Allison for most at the high-banked, 1-mile concrete track. 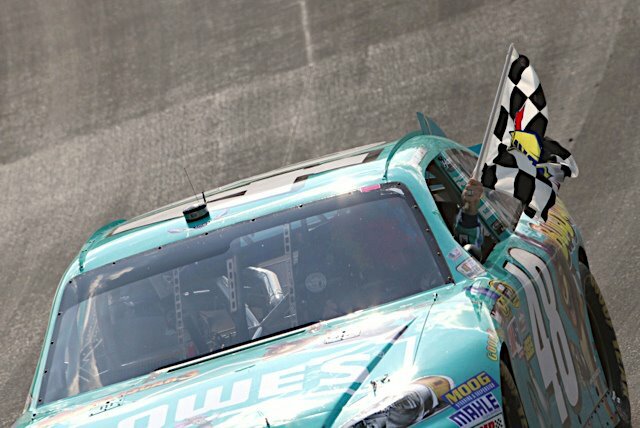 Harvick finished second, 2.550 seconds behind Johnson. Kenseth ran third, followed by Dale Earnhardt Jr. and Clint Bowyer. Greg Biffle retained his series lead by one point over teammate Kenseth with an 11th-place finish. Johnson said afterward that leading the most laps doesn't guarantee success, but on Sunday, he need not have worried. 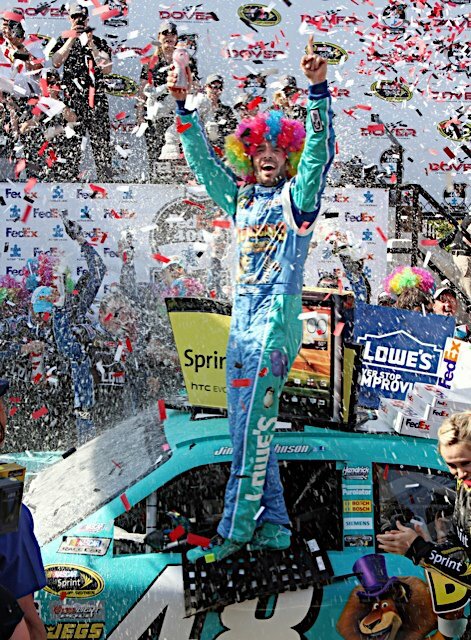 "When you lead the most laps, sometimes at the end -- the way the cautions fall -- it can backfire on the dominant car," said Johnson, who wore a multi-colored wig matching the "Madagascar 3" paint scheme on his No. 48 Chevrolet at his post-race press conference. "The way the cautions fell [Sunday], it allowed us to really flex our muscle and bring home the win. I'm proud of the effort. It was a brand new race car we brought to the track. 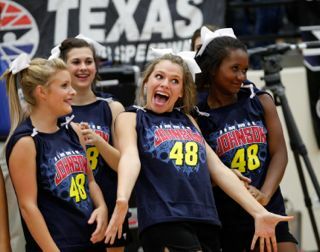 We pulled it off the truck, and it was awesome all weekend long." Harvick recovered from a mistake on pit road to claim the runner-up spot. The No. 29 Chevrolet driver overshot his pit stall under caution on Lap 227 and had to be pushed into the box by his crew. The miscue dropped Harvick from third to 18th for a restart on Lap 232. "The car was good enough to be able to drive back through the pack, and for whatever reason, we were able to adjust our car well [Sunday] when we needed to and we were able to keep up with the race track and keep our car better through the day," Harvick said. "And I think that was a big key to getting through the traffic and putting ourselves back in position to at least have a chance." Though Johnson won handily, his car might not have been the fastest. The No. 24 of teammate Jeff Gordon was at least its equal, but Gordon had to pit on Lap 250 because of a loose wheel. Gordon returned to pit road for his final stop on Lap 325 and was in position to challenge for the win until an untimely debris caution on Lap 339 temporarily trapped him a lap down and mired him deep in the field after he regained the lost lap on a wave-around. Gordon finished 13th. Those who have decried the recent lack of caution flags in Sprint Cup races got more than their fill on Lap 9, when contact between Tony Stewart's No. 14 Chevrolet and Landon Cassill's No. 83 Toyota triggered a 12-car pileup off Turn 2. Regan Smith ducked to the inside and tried to power past Stewart but couldn't clear him. Nine other cars stacked up behind Cassill, Stewart and Smith, blocking the track and necessitating a stoppage of 19 minutes, 54 seconds while track workers cleaned up the mess. Smith blamed himself for the wreck, but Stewart was magnanimous in relieving the No. 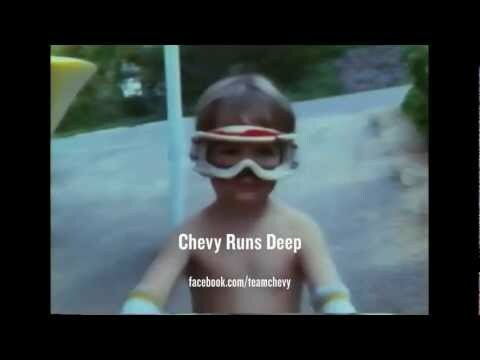 78 Chevrolet driver of responsibility. "I got into the back of the No. 14 and started the whole thing," Smith said. "I'll take full blame for that. Somehow they got checked up in front of me. I just didn't have time to get slowed up with it. I hate that there are so many wrecked race cars here. It's not fun for anybody." 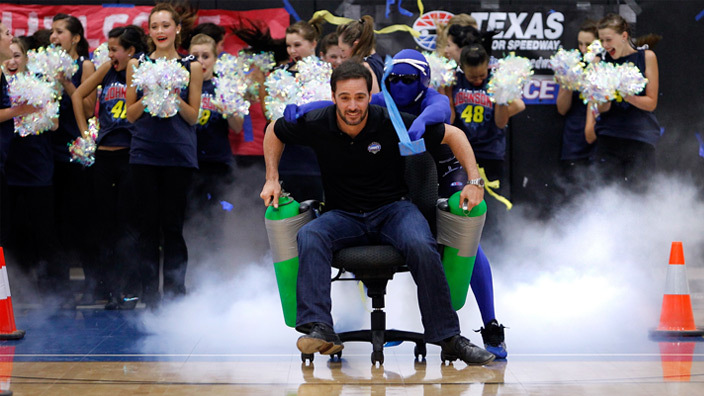 Stewart's take on the accident was quite different. "[Cassill] was trying to get back down to the bottom, and we were just in the wrong place at the wrong time," Stewart said. "It wasn't Regan's fault. He was right behind us, and he didn't have anywhere to go either. Just not a real good deal at the beginning of the race like this." Stewart returned to the track on Lap 74 and finished 25th, one position better than that of Carl Edwards, who blew a tire and slammed into the Turn 2 wall on Lap 164. 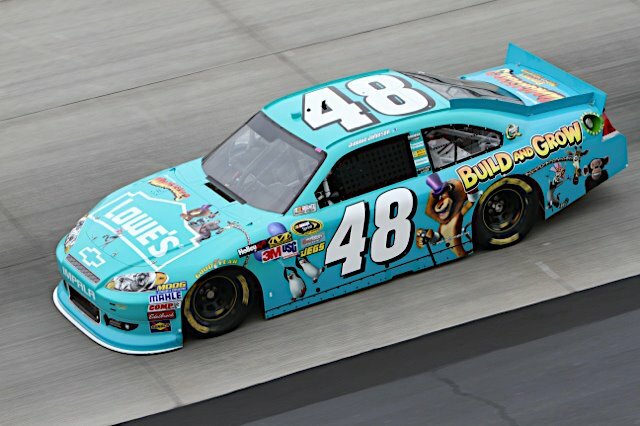 Down 80 laps when he returned to the track after repairs, Edwards dropped from 10th to 12th in the standings. Notes: Mark Martin finished 14th, marking the 30th straight Cup event in which the pole-sitter has failed to win. ... Johnson's victory broke a string of eight straight different Cup winners this season. ... Earnhardt gained one position, moving to third in the standings. He trails Biffle by 10 points. ... The engine in Kyle Busch's No. 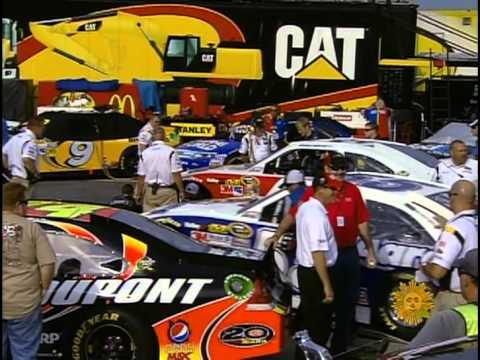 18 Toyota expired after 202 laps. He finished 29th.